You remember when the Canucks went retro for a game last season? It was against Toronto. I was pretty pumped to watch it as I lived and breathed the Canucks "skate logo". And to see Ryan Miller come out with the full on V logo mask just brought back even more memories of the Canucks teams from the early 80's (and John Garrett). So how did the hockey card world celebrate this great game, sweet uni and killer mask? Well they had a beautiful shot of Miller stepping on the ice as the photo of choice for their Portfolio set. Brutal. 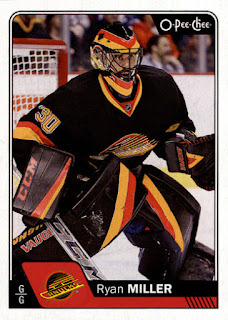 Well this year Upper Deck looked to right that wrong by including Miller (in his retro garb) in their robust OPC set. It was great to see.....almost. Once again....close but no cigar. So I guess I'll have to do things myself. There. Now was that so hard? 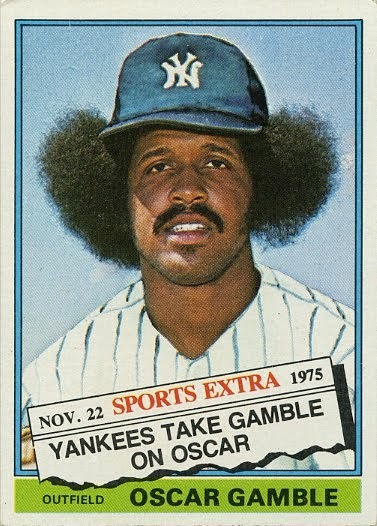 Now while I'd love to see a little more of an action shot (yes, I'm picky), this card of Miller would be the Ace of Spades in anyone's retro collection. Man that's a great looking mask. Your version is a definite upgrade. Love the throwback uniforms.